For both hill climbs and timetrials I have been tempted to run a single chainring in the pursuit of a few marginal gains. From an aesthetic point of view it also looks good. The only downside is a potential risk of chain unshipping and undoing any marginal gain you may have benefited from. Therefore, it is not just about taking everything off; you need a sufficiently good mechanism to stop the chain unshipping. Also, the loss of gears are a problem for some courses and training. Lack ramps and pins (which help with shifting). Also its teeth are taller its geared counterparts, which aids in chain retention. Narrow-wide chainrings have alternating widths between teeth to help with chain retention. Even, if get a specific single chainring, you might still want to consider a chain guard (e.g. 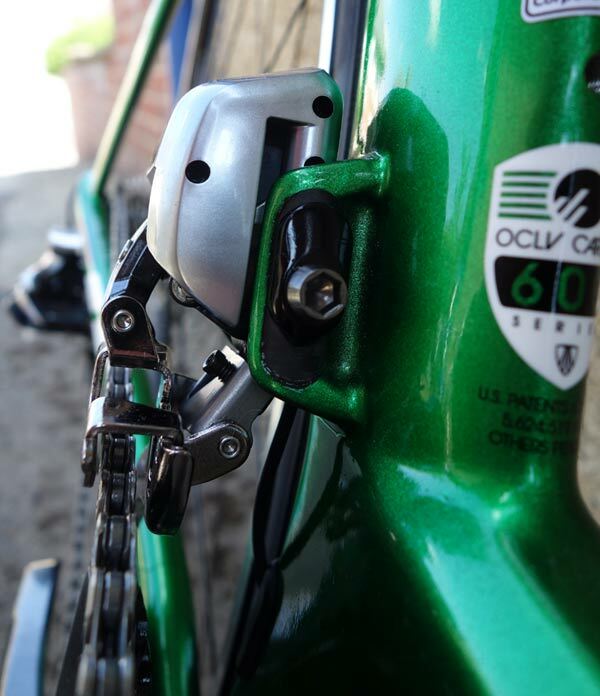 front derailleur / chain catcher) to be 100% sure against chain slip. Though opinion is mixed. If you have a special single ring use chainring – some will say you don’t need a chain-catcher, others will say ‘better safe than sorry’. Chain guard for single chainring with ordinary outer chain ring. 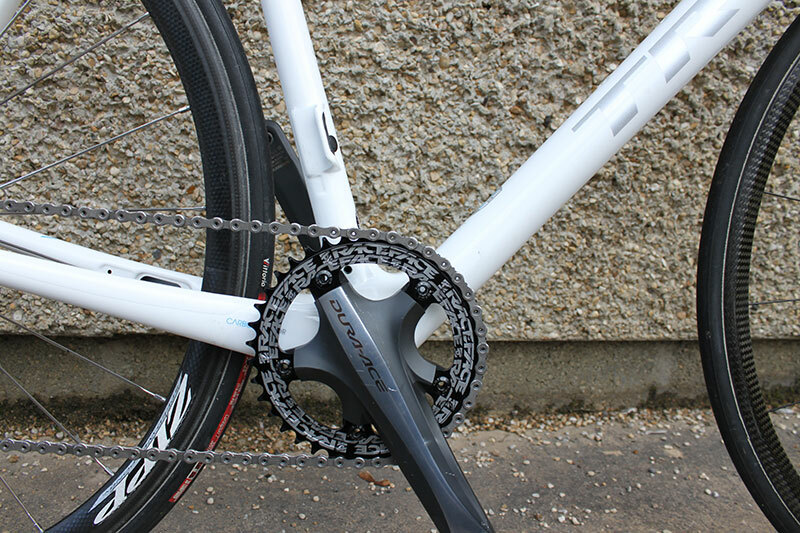 If you want to convert your existing chainset to single ring use. I would say 100%, you must keep front derailleur or satisfactory chainguard. 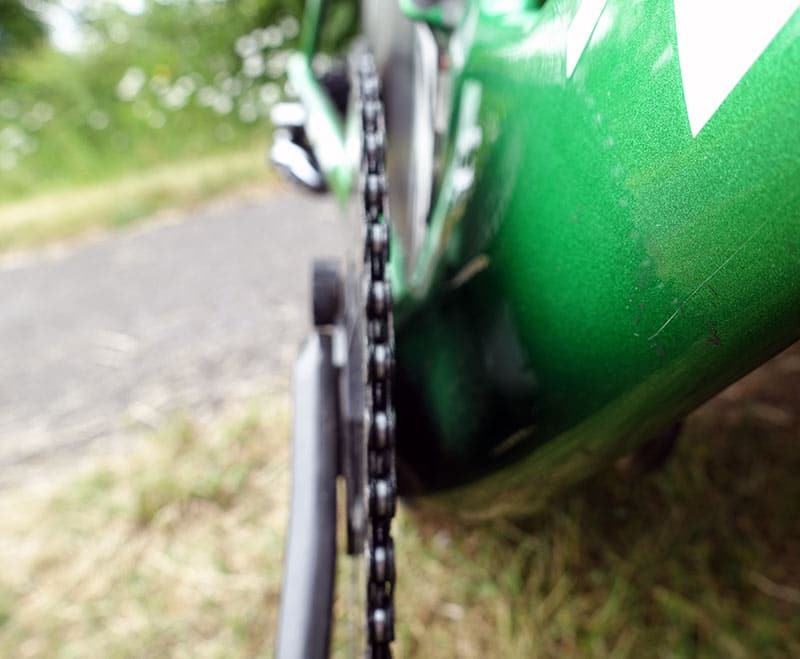 The time saved from removing a chain guard is minimal compared to the cost of unshipping chain, which may well happen at the most inconvenient time. I have spent a long time looking for a good, streamlined chainguard, and it was surprisingly difficult to find one. In theory, it could still fall off the outside, though that is less common. I used something similar on my hill climb bike last year. I even drilled the chain catcher ‘in the spirit of psychological marginal gains’ I used a chain catcher because with Shimano Dura Ace 4 armed bolt, I couldn’t find a specific single chainring. Depending on the groupset, you could easily save 500 grams, which is a good saving, especially since it is quite a cheap weight saving. In 2014, I was using a 5 armed chainring, so I bought a specific ‘narrow-wide’ chainring, so I didn’t use a chain guard. For hill climb bike the motivation for a single chain ring is weight. For time trials, the motivation is aero-savings. In particular, the Dura Ace di2 front derailleur looks quite a big block into the wind. Front derailleur hitting the wind. When I went to the Aerotesting, I didn’t test the difference (I could have) but I assumed just by looking at it, there must be some aero saving from taking everything off. There is a bit of a gap in the market in that it is hard to find a specific single chainring for a time trial oriented bike. Part of the problem is there are so many combinations of 4 arm, 5 arm, and different BCD (bolt circle diameter) e.t.c. and for most road riders, there is no consideration of riding single chain ring. Fibre Lyte Carbon single chain-ring. Training over bumpy roads has given no hint of chain slip. It is more reliable than my previous double chainring set up, where sometimes I had chain failure, due to difficulties of shifting between 39 and 56. I don’t feel need for chainguard, but I would add a disclaimer for anyone thinking of doing the same. 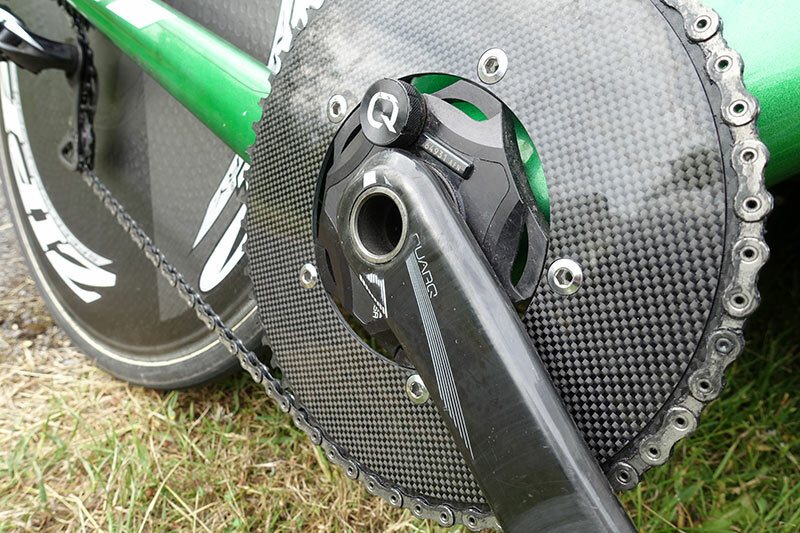 Aero Coach are also bringing out a specific TT single chainring soon. (I saw a prototype recently). I imagine this is a part of the market which will grow. So far, racing on a single chainring has been a good experience. On courses with only moderate hills, you never use the 39 inner chainring. Rear derailleur shifting is better with single chainring. I’m sure there is some marginal aero saving. Because I’m stuck with single chainring it has changed by training routes as you soon become over-geared on any climb over 5% – especially annoying when you’re on a recovery ride. On the positive side, I’ve been riding roads I’ve never been on before as I look out for the flatest routes. It feels a little strange as a hill climbing specialist to become fearful of any climb over 5%, but that’s what it is like. On the other hand, flat courses make for higher average speeds! I used a Race Face narrow wide chainring on 2014 hill climb bike. It is called narrow wide because the teeth have alternating profiles to offer better chain security. I never had any problems with chain slip and chain tension was good. However, my testing was relatively limited to road riding in September and October 2014, I also kept a pretty short chain. Looking at reviews, it scores highly, though some have said they need some kind of additional chain catcher (gear clutch, chain guard). It may depend on the type of riding you do. Is it worth it? Yes, so far, it is worth it for both hill climb bike and time trial bike. Even though there are some downsides in terms of convenience. I also still have nagging concern about chain slip from single chainring set up. I also have a Trek SC 9.9 (2012) and ive been having a real nightmare trying to get either a Qring 56T or KCNC 58T Chainring to fit with a Sram Red front Mech using a Double setup. a Q55 is the absolute limit other wise it catches on the top of the mech. I have thought about going to a single ring setup but felt quite nervous about the chain bouncing off at 30 mph! 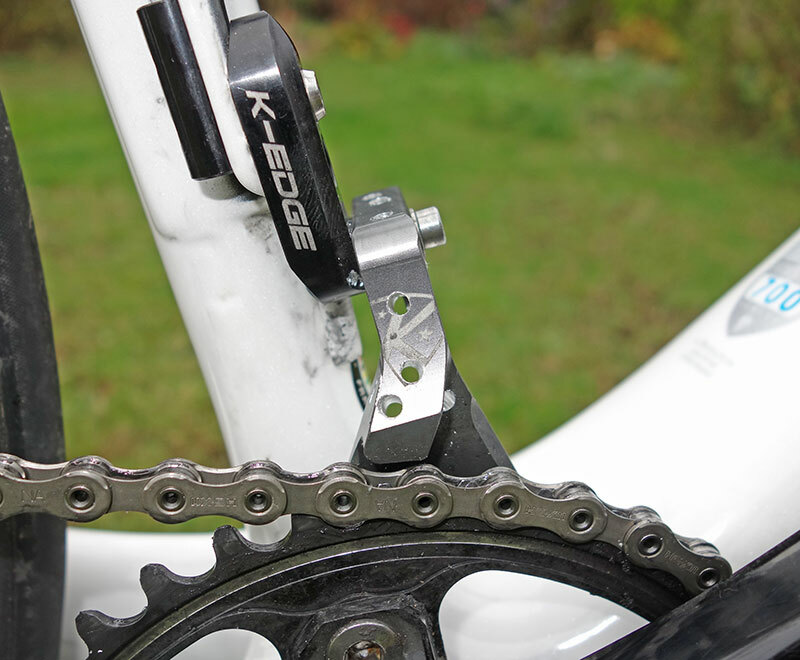 Ive just taken a look at the K-Edge catcher for the Road setup and also the cyclocross type that you are using on your hill climb bike. Have you tested the cyclocross type on your SC? I used K-Edge Cyclocross Clamp-On Chain Catcher – Single XL Braze-On for my hill climb bike, but I’m not sure if it is enough with no outer catch. Why are these chain catchers now supposed to be a necessity? I´m sure millions of miles must have been ridden without them since the advent of derailleurs in the 1950s. I don´t remember it ever being a problem, except, as mentioned, when changing between front gears. On a single…why? I want to try the fiber lyte chainring. What width have you been using for timetrail? 3/32?